Diamond Drainage and Groundworks Ltd - Builder, Drain/Sewer Clearance, Plumber based in Skippers Lane Industrial Estate, Cleveland. It is very important that drainage problems are rectified as soon as possible; this will prevent further damage, possible flooding and an unpleasant smell. At Diamond Drainage & Groundworks we are on hand to fix any drainage issues you have and to provide information about why the problem occurred and how best to prevent further issues in the future. Our groundworks services are usually required to implement the first-phase of the construction process. We are able to undertake all aspects of work to a formation level. 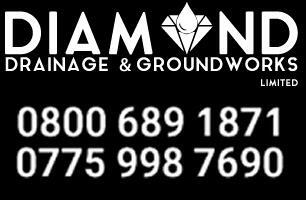 For any groundworks in the North East, Diamond Drainage & Groundworks offer a very professional service and of course all of our team are fully qualified. Our quotations are free of charge with no obligation so please feel free to contact us and we will let you know the full extent of the work that needs to be carried out. At Diamond Drainage & Groundworks we have an experienced and fully licensed workforce and all our staff have been fully trained in all aspects of Health and Safety. We have also developed an excellent reputation within our client base in the area. We have gained our reputation through the high quality of our groundworks services in the North East along with our friendly and approachable customer service. We know how difficult it is when something goes wrong in your home and you are unable to fix the problem for yourself. We also know how important it is for you to have peace of mind when it comes to choosing a company to rectify your issues.